Decomposition of plastic bags is not an easy task as it takes 15 to 1000 years to break down depending upon the environment. So, it is better to use a paper bag instead of a plastic or a polythene bag. The only way that the plastic bags can decompose is through photodegradation. This is done by the way of complete exposure to sunlight. When the plastics come in contact with direct sunlight. It breaks down into small toxic particles. Not only humans it has impacted the wildlife and countless other sea animals very badly. It is very harmful to the sea animals once ingested. The animals get confused by floating bags other plastic particles for edible sea life such as jellyfish and plankton. If this is injected then the plastic blocks the digestive tract and the animals starve to death. All the other animals get drowned after becoming entangled in plastic waste. The cost involved in recycling a plastic bag is much higher than any other bag. So most of the recycling facilities are not up to the mark. These bags are thrown away with rest of the trash. Public agencies in all the areas have taken the initiative to clean the city every year. The cost involved in this is increasing day by day. Many countries have banned plastic bags or have imposed taxes for using plastic bags. It has also led to an increase in the gas and petroleum prices as plastics are made from petroleum products and natural gas. Now considering paper bags, which is made from the skin of a tree and every year millions of trees are fell down to supply raw materials in the manufacture of paper bags. 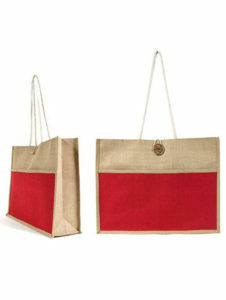 The best alternative for going reusable is Environmental shopping Bags. A reusable bag can be used for more than 1000 times than a regular one-time use plastic bag. If a person starts using a reusable bag for quite a long period of the time, then it is itself a reward for the environment. We are one of the leading jute bag manufacturers so, come let us join together and explore some good ideas for a clean and pollution free world.